Welcome to eastramapomarchingband.org, the official site for the East Ramapo Marching Band, located in the East Ramapo Central School District in beautiful Rockland County, New York State. Congratulations to all band members for this past school year, 2015-2016. Have a great summer. Upcoming: In August there will be a week-long band camp for next year, 2016-2017! Friday, June 24 - Appearance at Boulders Baseball game. 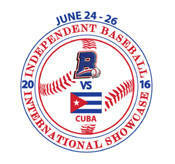 Cuban National Team versus Rockland Boulders, at Palisades Credit Union Park, game begins at 7pm. The park is at 1 Provident Bank Park Dr. Pomona, NY 10970 . Click here for a REQUIRED Permission Form for June Events. Thursday, June 16 - Appearance at Boulders Baseball game. 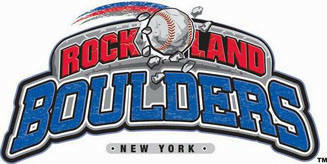 Sussex County Miners versus Rockland Boulders, at Palisades Credit Union Park, game begins at 7pm. Sat. June 18 - Rehearsal 9am to 11:30am at Spring Valley High School. Wear comfortable clothes and sneakers. Sun. June 12 - Nyack Parade - Details to follow. Wed. May 25 - Appearance at SEPTSA Awards Ceremony at Pomona Middle School. Wear Yellow Band Shirt, All Black Pants, All Black Shoes and Socks. Must bring signed permission slip! Students are not allowed to board bus without it. Click here for a REQUIRED Permission Form. Canceled: Appearance at Memorial Day Parade (Monday, May 30) due to expected weather conditions. Sat. May 21 - Rehearsal 8:45am to 11:30am at Spring Valley High School. New members are welcome - come register at 8:45am. Wear comfortable clothes and sneakers. Sat. May 14 Performance at African American Day Parade in Nyack. Dress Code: yellow shirts, black pants, comfortable black shoes (i.e sneakers) with black socks Note: this parade was originally scheduled for Sat. May 7 but due to rain predictions was changed to May 14. 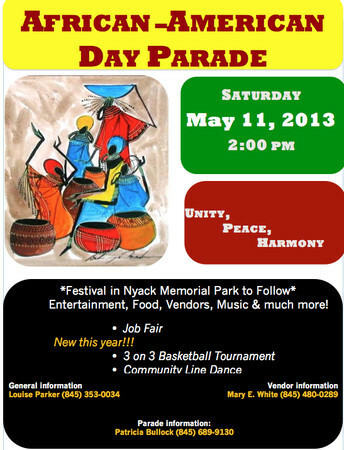 Nyack celebrates its 8th annual African American Day on Saturday, May 14, 2016, with a parade and multicultural festival in Memorial Park. The parade kicks off the festivities at 2:00pm. Marchers begin at Franklin Street and Cedar Avenue and then proceed down Main Street towards Memorial Park. The celebration continues in Memorial Park with music, vendors, food, and a job fair. Must have signed consent form and health history medical form on file!! You will not be allowed to board bus without both forms. Thanks goes to all the students and parents who came to the Coin Drop fundraiser on Saturday! Sat. May 7 - Rehearsal 8:45am to 11:30am at Spring Valley High School (the parade has been rescheduled - see below). The band will perform at the African American Day Parade, which will take place on Saturday, May 14. Note: this parade was originally scheduled for Sat. May 7 but due to rain predictions was changed. Click here for a REQUIRED Permission Form. Wear Yellow shirts, black pants, black shoes and socks. Note: You must bring flyer to restaurant. Saturday, April 30, at corner of 59 and 45, 11am-4pm. Note: You must get permission slip (found on flyer) signed by a parent/guardian. Tues. March 22. Performance at Board Meeting, Administration Building, 105 South Madison Ave, Spring Valley, NY 10977 Dress--Black pants, black socks, yellow shirts, Band Jackets. Tues. Jan. 5. Performance at Martin Luther King, Jr. Day Celebration at Ramapo High School. (for current band members performing, new band members can watch) Dress--Black pants, black socks, yellow shirts, Band Jackets. 2:45 p.m. Arrival at Ramapo High School, in Band room. There is one rehearsal this week. Wear comfortable clothes and sneakers at the rehearsal. Happy New Year! There is one performance and one rehearsal this week. Tues. Jan. 5. Performance at Ramapo Town Hall. Dress--Black pant, black socks, yellow shirts, Band Jackets. No Rehearsals or performances this or next week. No Rehearsals or performances this week. -> Please note that there is no band appearance on Friday, Dec. 4 (earlier a basketball game appearance had been scheduled). Mon. Nov. 30 Welcome Superintendent Performance The band has the honor of being part of the welcome to our new Interim Superintendent, Dr. Deborah Wortham. All parents are encouraged to attend. Leave at 6:15pm for Pomona Middle School. Return at 8pm (estimated) for Parent Pickup. Band members wear yellow band shirts, black pants, black shoes, black socks and band jackets. Our November fundraiser is with Rockland County-based Carousel Cakes. Carousel Cakes are made of the finest, fresh ingredients... just one taste will convince you! They specialize in chocolate cakes, cupcakes, cheesecakes and other fine desserts. Deadline for Orders (Cash or Checks Only) is Mon. Nov. 16 - Delivery in time for Thanksgiving! . Tues. Nov. 24 4pm-6pm Rehearsal at Spring Valley High. Leave at 7:30am for tour. (Lunch will be provided). Return at 4pm for Parent Pickup. No Buses will be available. Tues. Nov. 17 4pm-6pm Rehearsal at Spring Valley High. Thur. Nov. 19 3pm Rehearsal & Show Performance for Channel 12 News at Spring Valley High. Thur. Nov. 5 4pm-6pm Rehearsal at Spring Valley High. Last week's pep rally, football game AND Championship performances were fantastic. Great job. This week, there is a Spring Valley High football game at Torne Valley. Tues. Oct. 27 4pm-6pm Rehearsal at Spring Valley High. Thur. Oct. 29 4pm-6pm Rehearsal at Spring Valley High. WELCOME to WEEK 8 of the ERMB 2015 Fall Schedule. This week has a MAC Championship performance on Saturday, in Marching Band Class II. Schedule of the MAC Championship is available by clicking here. Directions to Naugatuck High School are available by clicking here. Admission for adults is $15.00. Admission for children (Ages 10 and under) is $10.00. Proceeds from this championship event fund Musical Arts Conference's (MAC) extensive scholarship program throughout the season. Friday is a Football game at Torne Valley for Ramapo vs. Port Chester, kickoff at 7:30pm. Tues. Oct. 20 4pm-6pm Rehearsal at Spring Valley High. Wed. Oct. 21 4pm-6pm Rehearsal at Spring Valley High. Thur. Oct. 22 4pm-6pm Rehearsal at Spring Valley High. For the Ramapo High School Pep Rally, WEAR YELLOW SHIRTS AND BLACK PANTS & SOCKS FOR RALLY AND FOR FOOTBALL GAME FRIDAY EVENING. Last week's football games were fun -- with the marching band there! The half time performances were excellent. WELCOME to WEEK 7 of the ERMB 2015 Fall Schedule. This week the band performs at the Spring Valley High School vs. Ramapo High School football game at the Spring Valley football field. Parents and families, come and cheer for the band and the football teams. Also, an appearance at the Cultural Arts Festival! Tues. Oct. 13 4pm-6pm Rehearsal at Spring Valley High. Wed. Oct. 14 4pm-6pm Rehearsal at Spring Valley High. NOTE FOR BAND: Dress appropriately for cool weather. Arrive before 9am, for 9am-11am Rehearsal at Spring Valley High School. Congratulations to all band members who attended Band Camp, and to those who performed on the last day, Thur. Aug. 27. Also, the last day's picnic dinner was a lot of fun for parents, band members, staff and families. WELCOME to WEEK 1 of the ERMB 2015 Fall Schedule! There are TWO performances this week, even before school has started. The band performs at both home games for Ramapo and Spring Valley High Schools. Parent and families are encouraged to come and cheer for the band and for the football teams. Tues. Sep. 1 2pm-6pm Rehearsal at Spring Valley High. Thur. Sep. 3 2pm-6pm Rehearsal at Spring Valley High. Meeting is Wed. Aug. 12 from 5:30pm to 7:30pm at Music rooms at Spring Valley High. NOTIFY ALL PAST MEMBERS. PASS THE WORD. We are all EXCITED ABOUT OUR 2015 BAND THIS YEAR. Come to Band Camp to learn routines, make friends, and find out all the great activities for this school year. Band Camp 2015 continues into its third week at Spring Valley High, with buses taking band members to Torne Valley Recreation Center on both days, Tuesday and Thursday. 6:00pm Parent Meeting -> Parents, each family are asked to bring one item for Thursday's picnic to be shared with everyone. Members brought home a flyer last Friday with further information. Congratulations on a great season. East Ramapo Marching Band officially ended its season this past week (Mon. June 1 - Sat. June 6). We will not have anymore rehearsals or events so that students can take the time to focus on their up coming finals. Everyone should take the time to study hard. Keep an eye out over the next few weeks for information pertaining to next years marching band. Take care and have a great summer. CONGRATULATIONS ON A GREAT PERFORMANCE AT THE HAITIAN DAY PARADE ON SUNDAY! Wed. May 27 - Rehearsal 4pm-6pm ALL Band Members must attend! We will be discussing the end of this season and the beginning of next season. Sunday May 24 - Haitian Day Parade in Spring Valley Band members wear Yellow Band Shirts with Black Pants - NO SHORTS. BAND MEMBERS MUST STAY WITH THE BAND: ALL THOSE TRAVELLING WITH THE BAND MUST RETURN WITH THE BAND ON THE BUS. Wed. May 13 - PARENT MEETING 6pm-7pm directly following the rehearsal. Saturday, May 2 - Performance at Boulder Stadium - Special Event. Monday, May 25 - Memorial Day Parade. Details to be determined. Sunday, May 24 - Haitian Day Parade. Details to be determined. 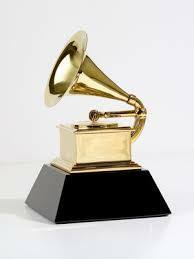 ERMB's Director Michael E. Smith is a semi-finalist to receive a Music Educator Grammy Award! All band appearances and rehearsals will be listed in the calendar (see link on upper left). Like last year, the ERMB plans to perform at each home football game. Other appearances are to be determined. This is open to current band members and their families. There will be a DJ for everyone to dance! We are asking families to bring a hot dish or vegetable dish or salad to this dinner. Families are bringing Baked Ziti, Chicken & Sausage, Chicken Wings (3 families! ), Fried Chicken, Chili, Curry, Lasagna, Meatballs & Rice & Peas, Igloo drink dispenser, Ice, Quiches, Salads, Rice & Beans (2 families. Heating trays will be available, so bring your hot food. We look forward to having you! The African-American Parade on Sat. May 11 in Nyack has been canceled and rescheduled for Saturday, May 18! Click here for a Parental Consent form for the Parade. Parents, we need you to please come to a parent meeting at 6pm on Monday, May 13. We'll have a short meeting to discuss the East Ramapo Marching Band's Dinner/Dance on the evening of Friday, May 31. Dr. Hodge will provide the DJ! Click here for a form - tell us what food you will bring. 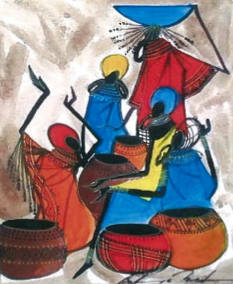 Come to Our Home Competition - "African Fantasy" ! The East Ramapo Marching Band is an award-winning band, winning Musical Arts Conference (MAC) Class I champions 2009 Championship on Nov. 14, 2009 (see picture on upper right). During this past Fall 2012 season, the band performed on the field and in the stands at every football home game of the Ramapo Gryphons and Spring Valley Tigers. They boosted team spirit at Pep Rallies for both Ramapo and Spring Valley High Schools. The band marched in the 25th Anniversary Nyack Halloween Parade, making our 16th appearance in the parade. The tour of the district's schools (and the administration building) the day before Thanksgiving was enjoyed by all. Competition season is September, October, November, and December. Click here for the Calendar of activities. Activities this season include band competitions, overnight trips, the home competition on Oct. 16, pep band and halftime performances at Spring Valley and Ramapo High School football games, command appearances, award appearances, the awards dinner, and the tour of the district schools. During the Summer, the band has a couple of practices before the week-long Band Camp in August. The Calendar link on left lists the current information. In the Spring, the East Ramapo Marching Band participates in parades and events. This time of year is called "Parade Season." See the Calendar ( Click here for Calendar ) for current information. After the competitions in the Fall, several band members participate in two support groups of the East Ramapo Marching Band: Winter Percussion and Winter Guard. This is the winter season, in December, January and February. Both groups have joint rehearsals together every week, and also both groups go to competitions (each group competes alone, although they go to competitions together). 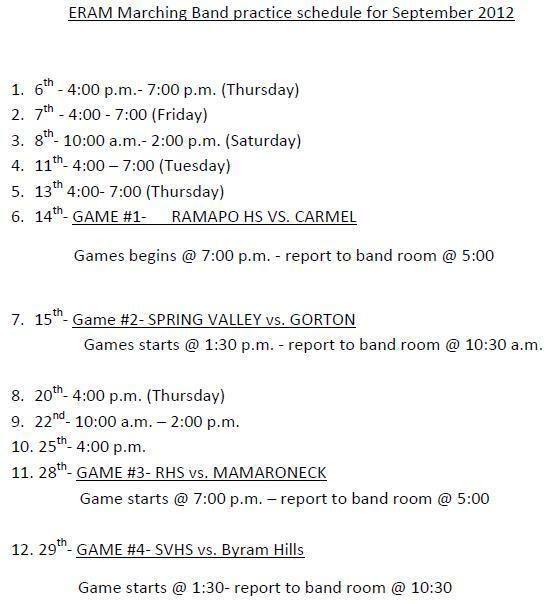 Also during this season, the East Ramapo Marching Band supports our Ramapo High School's and our Spring Valley High School's basketball games. Please ask your parents to be on time to pick you up. Let me express how ecstatic I am to be the 2012-13 East Ramapo Marching Band Director. I was extremely excited to receive the news. I am looking forward to meeting those of you who I have not had the pleasure of meeting, and anxiously await to see familiar faces. As a organization I am sure we wish much success to Michael Smith in Nyack. Band students and parents are fortunate to have such a leader. I am sure “Smitty,” as he likes to be called, will be an asset to the musical development of his students. Though Smitty will be missed in East Ramapo, I expect we will have lots of fun making great music. You will find that the schedule for the marching season is not be “life consuming.” Though I am a marching band person with much experience I also realize each of you have other obligations. Since there was no band camp in August, competitions will not be part of our season this year. We will continue to support our football teams (Spring Valley and Ramapo High Schools) by playing for all home games. I do intend to have you marching on the field to some degree, so be prepared to march each rehearsal. Drills will be basic and something we all can contribute to. We will also participate in the Nyack Halloween Parade, which I know you look forward to. Again, things will be different and at times possibly challenging. But, hopefully we will persevere through those moments, continue making great music, and have fun in doing so. Students will have a major role in our decisions and success, so come to all practices with fresh and creative ideas. I am open to your ideas and look forward to seeing how original you can be. Have a great school year and, help keep music alive!!! See you soon. Click on September schedule below to download a pdf of the schedule. Thank you for your patience as we make this major transition for the East Ramapo Marching Band. We are heavy at heart at the loss of Mr. Smith (Note: Mr. Smith was hired by Nyack School District) after all of these years but we are happy that he is beginning a new chapter of his life as band teacher and marching band director in another district. We are beginning a new chapter in our lives as well and we need to honor Mr. Smith and ourselves by continuing on the path to a new and successful year of Marching Band. This can only happen if each one of you prepares to move forward with SUCCESS as your focus. You have the foundation, talent and energy to continue as the outstanding marching band that you have become. We have made recommendations for a Marching Band Director and related positions. Their names will be brought before the Board of Education for approval on September 4, 2012. Marching Band will begin as soon after September 4, 2012 as possible. Please contact me at ethevenin@ercsd.k12.ny.us or in my office after 9/4/12 at 845-577-6018 any time with any questions or concerns that you may have. Thank you and enjoy the remainder of your vacation! The Rockland County Legislature has invited Michael E.Smith to a special meeting before the full Legislature Body on Tuesday, July 10, 2012 at 6:15 pm. Michael will be presented to the Legislative Body by the Honorable Aron E. Wieder for recognition and honor for services rendered to the East Ramapo Central School District and to Rockland County from 1984 to 2012. An Invitation is extended for everyone to witness this memorable event. If you have been affected by Michael E. Smith, because you are a colleague, a student, a parent, attended one of his concerts, or just appreciate how much he has done for all the children of Rockland County, then you do not want to miss this event. Click on picture for a flyer (in .pdf). Please be at Lafayette Theater in Suffern by 12:15pm. Be prompt. Your show will be performed one time only, followed by viewing of the movie. Do not go to Ramapo High School as there will not be transportation. Bring your instruments and flags. Doors open to public at 12:30pm. Lafayette Theater is on Rt. 59 in Suffern, across the street from Avon and Sacred Heart Church. There is a parking lot on Washington Street. Additional parking is in the rear. Tickets- $10.00 each. Write your name on envelope with the money and extra tickets. I will be at the theater early to collect them. Bring friends, families, and more friends and families. Still want to join the East Ramapo Marching Band? Have your parent fill out the Travel Release and Information form, and bring it to any rehearsal. We are looking forward to having you in our band. Please see the Calendar for any changes to the schedule (see link on left). Disney Performance- The band will be performing at Disney in Orlando, Florida. We are accepting payments for your trip and/or for your child. Please check website for further details. Evelyn Watford, Pres. Band Parents Assoc. Bring this form with you to a rehearsal and give to the director. Check the Calendar for current schedule. Click on "Walt Disney World" picture for a flyer and form for the Spring Break 2012 trip. Interested in Joining a Band Committee? We need your help for the East Ramapo Marching Band to succeed. Consider joining a Band Committee: Click here for a list of Band Committees Fill out the form below and be sure to mention which Committee you are interested in joining, and click on Submit!